Since opening last October, The Cup n Board, a new specialty foods market in Swampscott, has been steadily gaining Internet buzz, a new favorite of food and wine bloggers and craft beer devotees. Located on Burill Street, directly across from the commuter rail station in the former Fiory’s Market space, the spot is both convenient and awkward. Those unfamiliar with the area may find it difficult to navigate, but there is plenty of street parking on the adjacent block, and it’s perfect for commuters. 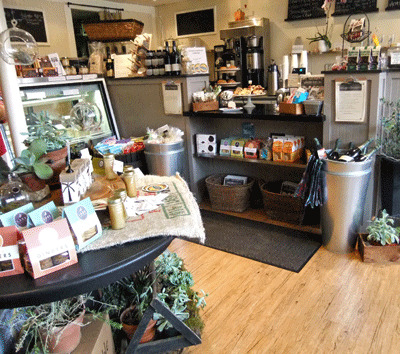 A small wonderland of local, organic, and fair-trade items, Cup n Board is worth stepping into just to peruse the shelves. Many local favorites are in evidence, along with beautiful baked goods supplied by Christopher’s Café in Lynn, a nice selection of cheeses, fair trade coffee, organic teas, and gelato. 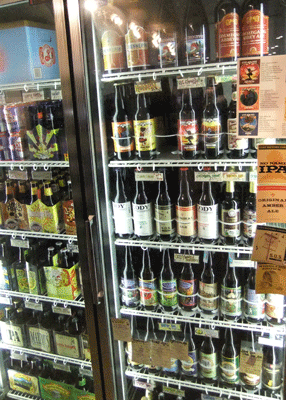 Although the market carries a respectable selection of wines, the real standout is the craft beer case. The impressive array of imported ales and craft brews includes local favorites like Clown Shoes, Cody, and Notch Sessions as well as Pretty Things, Blue Hills, and Mayflower. If you’re hesitant to buy a whole six pack in order to try something new, many are available as mix n’ match, so you can put together a combination to take home. Cup n Board holds one beer and one wine tasting a month, each accompanied by small bites crafted specifically for the occasion. In July, they’ll have a Notch Session beer tasting with Chris Lohring of Salem on the 8th and an Argentinean wine tasting with Swampscott’s Michael Lancaster of Global Wines on the 22nd. Swampscott resident Susan ‘Suki’ Ellsworth and several neighbors developed the idea of the market together, but when the others backed out of the project, she decided to continue on her own. With a background in catering and food service, a ready smile, and an upbeat manner, Ellsworth seems ready to take on the world, one fabulous sandwich at a time. And the sandwiches are really that great. At $7.95 a pop, they are large enough to save half for later and stuffed with fresh ingredients. 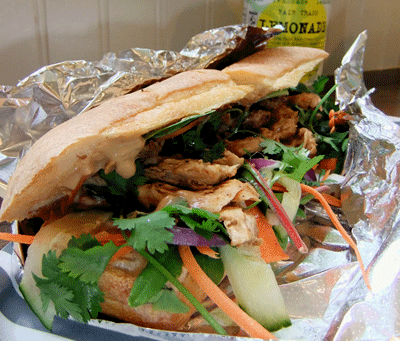 On our first visit we tried the Thai Chicken, which contained chicken, lettuce, carrots, onion, cilantro, spicy sauce, and peanut sauce in a lightly toasted roll. It was crunchy, savory, and delicious. We also tasted the Vietnamese: carrot slaw, cilantro, cucumbers, red onion, siracha, and soy with pork (you can substitute portobello mushroom), which had much more of a kick. Another night we called ahead an ordered sandwiches so they were ready for pick up after stepping off the train. The Rueben was a lighter, pressed version of the classic, with turkey in lieu of corned beef, and the Mediterranean was a taste revelation. 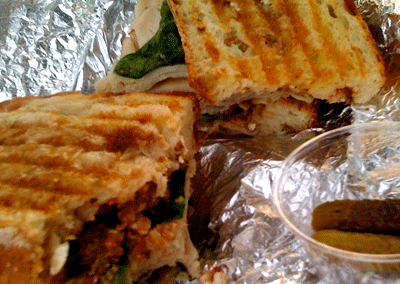 A pressed sandwich with turkey, olive spread, red onion, spinach, and feta cheese, it was tangy and unique and will definitely be making a return to our table. Ellsworth also offers a variety of salads for $6.95 each, based on what produce is locally available. The Cup n Board is open from 6:30 am to 7:00 pm during the week and 9:00 to 6:00 on Saturdays so commuters can grab their coffee and muffin heading in and a light dinner and libation on the way home. You can find additional information about daily specials on their Facebook page.